Tough break today for corn and soybean futures as USDA confirms the age-old adage that “big crops get bigger”. 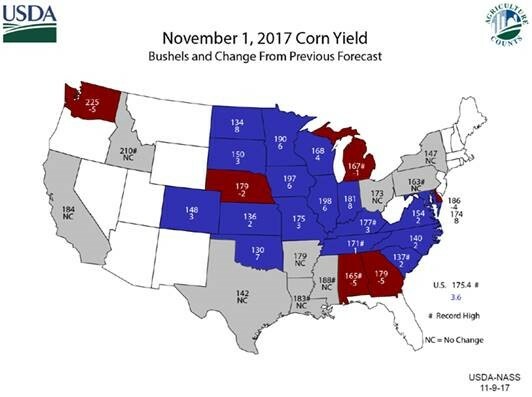 The Nov Supply & Demand report, released at 11 a.m. this morning, increased nation-wide corn yield 3.6 bu to 175.4 bu/acre (83.1 mln acres x 175.4 bu/acre = 14.5 bln bu, up 300 mln from last month). 175.4 bu/acre tops last year’s record of 174.6 bu/acre. There’s a lot of numbers floating around here – in my mind, the most important one is the carryout estimate. Last month, USDA estimated our corn carryout to be 2.340 bln bu. This month, that mushroomed to 2.487 bln bushels. To put this in perspective, that is about 1 bln bushels more than the 1.5 bln bushel C/O that makes the market “uncomfortable”. In other words, we have a 1 bln bu. cushion before things get “uncomfortable” (that’s the equivalent of 1,000 corn piles or 250,000 rail cars). It’s tough to pull any bullish news out of today’s report, but USDA did increase feed usage by 75 mln bu and exports by 75 mln bu., both signs of increased demand. Unfortunately for futures prices, the supply side of the equation is outpacing the demand side. Some in the trade have questioned why corn futures aren’t down more than (currently) 5c. My response would be that Spec Money & Fund Managers are already very short corn futures. Had the speculative crowd been long, there’d be a lot more gasoline fueling this selloff (as fund managers would be selling much more heavily). Perhaps a silver lining is the fact that fund managers are short – it could be argued that a short-covering (buy back) rally is coming at some point. It’s not a guarantee – but something to be cognizant of. I wish the story were different for soybeans, but they are marching to the same drum beat as corn. Soybean yield was steady vs. last month, but the market expected a .2 bu drop. This left the entire soybean supply & demand balance sheet unchanged from last month. Carryout is estimated to be 425 mln bu, nearly 125 mln bu. more than last year – keeping the market comfortable with soybean supplies for the next 12 months. The variable soybeans have that corn doesn’t is what the South American crop will be. Any weather hiccups or production issues in the south will change the landscape for soybeans very quickly. However, we all need to remember how big the crops in SAm were last year. Boats are still being sold out of Brazilian ports this month, proving that last year’s SAm soybean crop has a very long tail to it. There are lots of moving pieces to our puzzle – and right now the bears are having their way. It’s easy to subscribe to the “too much grain, not enough demand” narrative this time of year. While the numbers are bearish, it’s important to stay objective in our observations and realize a lot can happen in the coming months. Opportunities will present themselves. However, we may not see the prices we want – which means we must be prepared to execute when we get small wins. Ball games are won with singles & doubles, not home runs. Stay low & keep your feet moving.